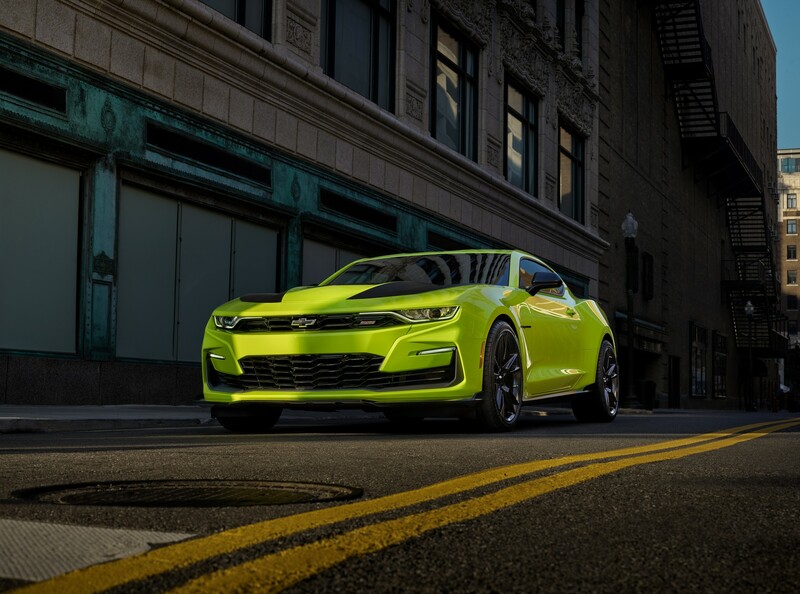 The countdown to SEMA continues as Chevrolet has unveiled the Camaro SS Shock concept. 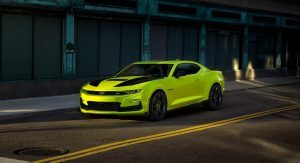 Designed to preview an assortment of options and accessories for the facelifted muscle car, the concept is named after its Shock yellow paint job which will be offered on the production model early next year. The color is certainly eye-catching as it’s basically a high visibility safety jacket that you can drive. 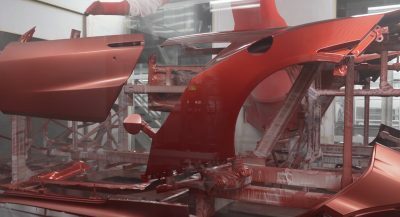 Besides the special paint job, the Camaro has been equipped with accessories and performance parts as well as concept components. 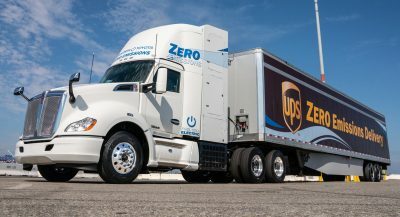 The company didn’t go into details, but the concept features black hood stripes, black mirror caps and dark wheels. We can also see a ground effects package which includes a front splitter and extended side skirts. 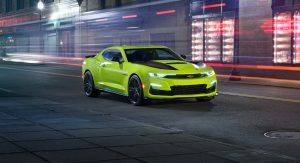 While Chevrolet was tight-lipped about specifications, the automaker said the 2019 Camaro will be offered with an “expanded portfolio of accessories and performance parts.” Key highlights include cold-air induction kits, a Brembo front brake kit and suspension components sourced from the Camaro 1LE. Customers can also order Recaro sport seats, a black spoiler and a fuel door with an exposed carbon fiber insert. 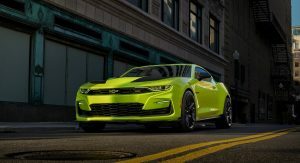 There’s no word on performance specifications, but the 2019 Camaro is offered with an assortment of engines including everything from a turbocharged 2.0-liter four-cylinder with 275 hp (205 kW / 278 PS) to a supercharged 6.2-liter V8 developing 650 hp (485 kW / 659 PS). While Chevrolet only unveiled one Camaro today, the company has plans to display more than a dozen models at SEMA. Among them will be four concepts based on the 2019 Silverado. The front end looks a lot better compared to the production SS model. Probably because that black piece is now painted to match the body and they moved the bowtie back in the correct position. It’s such an improvement. More companies need to bring out bright fun colors like that! So sick of boring plain colors! Why 15 different shades of gray/blue, steel, black/grey, grey/greenish, steel/greenish, etc. Fkin’ kill me! The Camaro (ever since the introduction of the 50th Anniversary (current generation pre & post facelift) Mustang in 2014) has been falling behind Ford. I personally remember a time when the Camaro was king, and it seems both the mustang and Camaro have swapped places in their overall appeal. But if I may suggest one thing, if Chevy can build the Camaro (the base model variant) to look like what we see here in this concept (exactly as it is, or better), I personally believe that the Camaro will once again be able to give the mustang a run for it’s money, if not even more so. 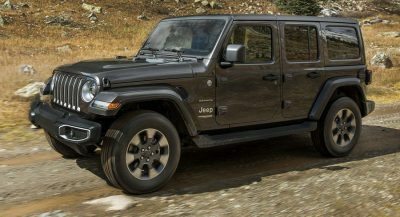 The changes in some panels, the curves in the hood, the look and feel of the vehicle, (in comparison to the current production model) may be minute, But if handled correctly, I personally believe we could have something on Our hands here. This is what I expect a Camaro to be, a properly sculpted, well built, ‘proper’ successor (in my opinion) to the 5th generation Camaro. I do hope this concept becomes a reality (and although the changes are small, they make all of the difference in the world) because; If they build it,.. I assure you, they WILL come. Whate are you talking about? 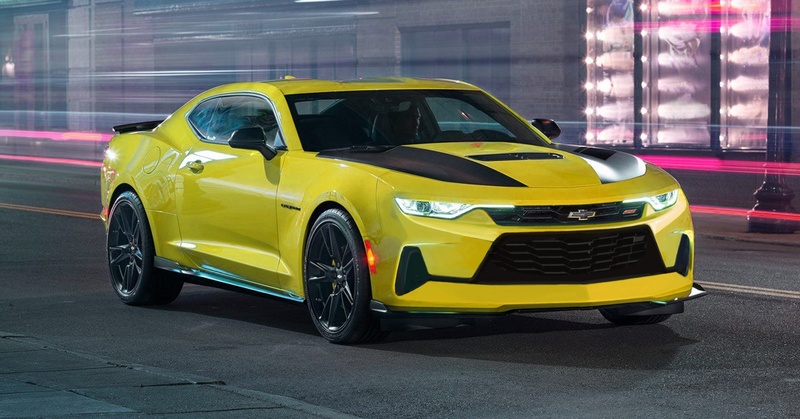 This concept is just a 2019 Camaro SS model with painted frontbumper and relocated bowtie emblem. There are no changes to the body or hood. My dad told me when he was younger, Camaros were faster but Mustangs had more appeal. In my opinion, the same goes today. The Camaro ZL1 1LE is much faster than the Mustang Shelby GT350R, but I’d take the Shelby over the ZL1 without any hesitation. Based on general SS/Trans Am vs GT the F-bodies have pretty much had a performace advantage since the LT1 was introduced in 93, and definitely once the LS1 was in in 98. I think the fox bodies had it on the third gens for performance (power and speed, not including specials of the time like the first Firehawks), but the 3rd gen was a better looking car. If only this grille was on the 2019 Camaro SS, Chevy would have nailed it with the exterior (and if the taillights were blacked out). 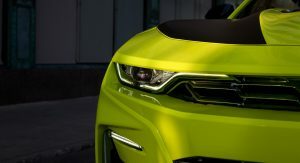 Chevy must put this front in the 2020 model year Camaro. Without the black center part and the bowtie now higher the SS looks so much better.